Sitting by my computer with earbuds in on a Sunday afternoon a few minutes after finishing episode 32 of The Best Hit, I let the wave of nostalgia and bittersweet schmaltz wash over me slowly. I knew that I was going to miss tuning into the show; that the post-viewing show hole slump would be strong following the end of this drama. Week after stressful week, I eagerly looked forward to The Best Hit and its two-hour weekend alms of feel-good fun. Slapstick moments, endearing relationships, relatable characters, and heart-warming messages about life provided me the break that I needed from the trappings of my everyday cycle. Even in The Best Hit‘s most melodramatic moments, the show never ceases to dish out small morsels of ironic humor to ease the heart-wrench; ensuring that it never quite loses its light edge. And you might be wondering: why did I include a reference to a certain Lionel Richie hit from the ’80s in the title of this review? Because of the song and drama’s shared feel-good aura, along with my inkling that the lyrics paired nicely with the review’s cover picture and that the oldie would have somehow fit well within the show’s vaguely old-school setting. Starting from the beginning, the drama stars Yoon Shi-yoon as off-the-wall ’90s pop sensation, Yoo Hyun-jae — the crucial half of the renowned musical duo, J2. Hyun-jae mysteriously disappears in 1994, but unexpectedly traveled into 2017 in 1993. In the process, he reunites with his old manager, Lee Gwang-jae (Cha Tae-hyun), who holds a grudge against him for essentially instigating the downfall of his company — World Entertainment — by running away with all of the liquid earnings of J2. He also comes into contact with Gwang-jae’s adopted son, Lee Ji-hoon (Kim Min-jae). 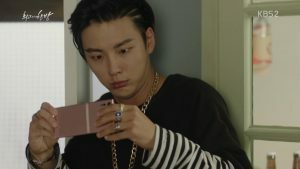 Ji-hoon happens to be Hyun-jae’s biological son — unbeknownst to Hyun-jae until the middle of the series — who also has a bone to pick with him for being a deadbeat dad among other things. Meanwhile, rom-com hijinks ensue between Hyun-jae and the no-nonsense college student Choi Woo-seung (Lee Se-young), who nicknames him “Thumbs Up” because of how frequently he utters the old-fashioned phrase. Since Ji-hoon has been pining for Woo-seung for God knows how long, this places Hyun-jae into an awkward love triangle with his son. Throughout the time that all of this is going on, Hyun-jae is also trying to figure out ways to return back to his time period, find where he left the cash from World Entertainment that he made off with in 1994, and solve the mystery behind his subsequent disappearance. Gathering all this information from the first several episodes, it seemed as if the plot had the potential to devolve into a huge mess. I had some questions: how were the writers going to resolve both the time-travel plot and the relationships without neglecting one or the other? Which aspect of the show will take importance, the time travel or the romance? Time is a funny thing. Sometimes time itself tells you that it is time to move on to other moments in time, and when that time arrives, you can’t really predict it; you can’t explain it; you just have to obey the ticking clock that is destiny, and I think that this is that time. In a nutshell, this quote describes The Best Hit‘s time travel plot. It is never fully explained or resolved; you have to shut off the logical part of your brain and just go with the flow, so that it doesn’t act as an impediment to your enjoyment of the show. There isn’t much rhyme or reason as to why sliding down the stairs of his rooftop apartment on a board allows Hyun-jae to travel back and forth through time. Although the writers do attempt to offer an explanation as to why it happens, even this is riddled with a continuity issue. It is implied that the twin typhoons of storm Kaola have enigmatic capabilities to transport Hyun-jae across the time-space continuum. However, this is tossed aside in the end when Hyun-jae manages somehow to make it back to 2017 from 1994, even as the skies in the present are as clear as day. There is a large amount of willing suspension of disbelief required of the viewer. The mechanics of time travelling are never fully fleshed out: we don’t ever find out how Hyun-jae splits into two people in the past timeline, why he ends up in 2017 of all decades, or how he so conveniently manages to make it to the year 1994 when he wanted to go back to ensure the safety of those in the present. Furthermore, if you’re a time travel aficionado looking for a sci-fi fix, you’ll be sorely disappointed. There is no Steins;Gate-level delving into the complex string theory or butterfly effect. How Hyun-jae’s small changes in action in the past might affect the future in sizable ways is never probed into; the series never even offers a quasi-scientific explanation as to how the time travel happens. Instead the nature of time in The Best Hit is portrayed as completely random, unpredictable, and simply confounding — its vassals controlled by some unforeseen and mysterious force (although, in the case of The Best Hit, this force is the will of the show’s writers). But one flawed plot thread doesn’t necessarily indicate that the drama is all fluff and no substance. Where the show shimmers the brightest is its outstanding character development and relationships. Watching the characters evolve ever so subtly throughout the course of the series and letting their delicate changes creep by surreptitiously, only fully sinking in at a much later interval, was truly a gratifying experience. Their backstories and motivations are fleshed out without the over-usage of drawn-out, mawkish flashbacks — not completely neglecting the influence of the past on the characters’ identities, but rather emphasizing them as they are in the present. Much like people in real life, it is shown that while their pasts significantly shape their identity, their current decisions and relationships play just as an important role in who they are as individuals. The characters strike authentic in the sense that they feel like myself, my family, and those in my friend circle. Probably anybody could relate to the characters’ issues, and the show neither trivializes nor dramatizes their problems. There’s Woo-seung, who appears to have a repressed passion for music, but finds more appeal in the stability of a civil servant job. She studies fervently for the civil servant exam while working various part-time jobs to afford living expenses, even as she continuously fails the exam and it becomes increasingly clear that perhaps it is beyond her capacity. We see traces of Woo-seung’s motives for doing what she does through the characters’ dialogue and her actions. Undoubtedly, her mom has a huge impact on her. With her mom constantly moving Woo-seung around as a child and causing her to change her last name, her childhood was evidently tumultuous. 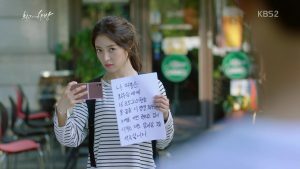 In the present day, Woo-seung’s mom doesn’t call her unless she has an ulterior motive; her phone calls enough to give Woo-seung a 180-degree mood swing. Understandably, this makes Woo-seung desire to implement stability in her life, which is reflected by her career choice and her boyfriend in the very beginning of the series — who she states she is in a relationship with because of his predictability. Ji-hoon is near the other end of the spectrum, though not at the complete opposite pole. He appears to have a clear aspiration: to make an official debut at Star Punch Entertainment and become an idol. However, like Woo-seung, he has also failed numerous times to reach his goal — to the point of earning the title as the oldest trainee in the company. Inevitably, this takes a toll on his morality and causes him to doubt his proficiency as an idol. This isn’t helped by the fact that his father, Gwang-jae, is completely set against his idol ambitions and prefers that he becomes a civil servant. It is made extremely apparent from the get-go that his biological dad, Hyun-jae, and his mom Hong Bo-hee (Yoon Son-ha) were both famous performers. In addition, Gwang-jae runs an entertainment company and still manages the trot duo, Helter Skelter. Ji-hoon has practically grown up around the music industry, so it follows that he would possess a penchant for it. 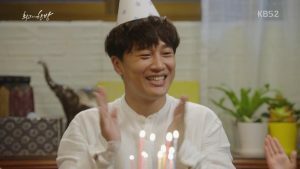 Ji-hoon’s comic-relief wannabe rapper friend, MC Drill (Dong Hyun-bae) has the same aspirations to debut in Star Punch Entertainment, but his stage fright and old age serves as an obstruction to his dream. 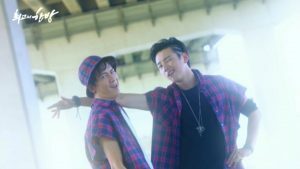 Through Ji-hoon and MC Drill’s journey, we are provided with a refreshingly realistic look at the idol industry. The fickleness of the scene isn’t glossed over; it is made evident that, regardless of the hard work and dedication of trainees, luck and other factors are equally important when it comes down to being selected to debut. For instance, regardless of Ji-hoon’s earnest devotion to training, he isn’t selected for the debut team because there was only one more spot left — and another trainee happened to be preferred by the judges. In spite of the fact that MC Drill made it onto the debut team, he gets fired shortly after. In addition to our two friends, there is a girl trainee named Do Hye-ri, played by WSJN‘s Bona, who is unable to debut for a long time. Despite practicing so much to the point of being given the nickname “Intense Hye-ri”, an eating disorder holds her back from officially debuting. Next, Gwang-jae runs the nearly obsolete World Entertainment. As a result of what was thought to be Hyun-jae’s betrayal in 1994, Gwang-jae is drowning in debts, struggling to pay the bills, and is at constant risk of losing his business building and home. Because he experienced firsthand how risky the entertainment industry is in terms of income, he wishes that Ji-hoon doesn’t face the same thing. Bo-hee is, to put it frankly, a washed-up has-been singer living with Ji-hoon and Gwang-jae longing to make an official comeback but continually failing to do so. Like Ji-hoon and Woo-seung, we see her doubting her competence as an entertainer, questioning herself and her abilities. Finally, Lee Soon-tae (Lee Deok-hwa) is the other head of World Entertainment. In 2017, he is just your average senior citizen coping with a sudden onset of Alzheimers, trying his best to not to forget his granddaughter, Mal-sook (Lee Han-seo). Although I couldn’t personally relate to his story, the poignant moments and touching scenes in Soon-tae’s character arc reeled me into his journey anyway. None of these characters described previously are blood-related with the exception of the Bo-hee/Ji-hoon and Soon-tae/Mal-sook pairs, but they are essentially one big extended family connected under the same roof. When Hyun-jae arrives, he shakes up their world by acting as a catalyst for their change and growth as people. It would be a disservice to the series to shorten and simplify the rich development that each character undergoes. But to cram a detailed account of each individual’s metamorphic story within this one review would be to bestow an extremely length read. To make this review more compact, the change that is sparked by Hyun-jae’s encounters with the different characters, along with the consequent themes and relationships of these fortuitous meetings, will be examined in the second part of this review.